The kaiten was a manned torpedo launched from a submarine, and after being launched the pilot had no way to return to the submarine. Many Japanese kaiten pilots perished without hitting enemy ships, since the kaiten had no escape system or means to communicate with the mother submarine. 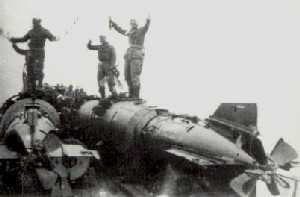 This web site on Kaiten Tokkōtai gives a detailed record, with numerous historical photos, related to the Japanese Navy's use of the kaiten human torpedo. Yasuto Kato created this outstanding web site after he found out his great-uncle died as a kaiten pilot. Lieutenant Fujio Kawai, commander for the Hakuryū Group of the Kaiten Special Attack Corps, died in March 1945 at the age of 23 when the submarine carrying his kaiten was sunk by a U.S. submarine. This web site contains Kawai's album of 18 photos and a page on his personal history. The site's wealth of other material reflects Katō's thorough research and the support he received from the National Kaiten Society and former kaiten pilots. The web site has separate sections for the ten different groups of the Kaiten Special Attack Corps. These ten groups had individual names (e.g., Todoroko, meaning "great roaring sound"), and each group included submarines that departed from homeland bases at or near the same time. The site includes background on kaiten and the Pacific War, firsthand accounts written by former kaiten pilots, and information on recent memorial ceremonies, books, and documentaries. The site also has a message board and a page with links to other web sites on special attack forces. The site's English section contains many pages and has acceptable translations. One especially interesting page gives an English translation of an interview with two former kaiten pilots, which was originally published as an article in the May 1999 newsletter Tokkō (Special Attack). They candidly discuss recruitment, training, and how they viewed death. Although the English section has numerous historical photos and details, no page provides a historical summary of Japan's kaiten program. The book Kamikaze Submarine by Yutaka Yokota, a former kaiten pilot, gives the basic history of kaiten operations, so reading this beforehand will help web site visitors better appreciate the photos and other detailed information. The webmaster, Yasuto Katō, presents the historical material in an objective manner and also gives opinions from former kaiten pilots and others. He states that his objective is that we never repeat war nor suicide attacks. He writes, "I, as a webmaster of this antiwar web site, pay my profound respect to the souls of all who perished in wars all over the world. I sincerely hope their souls will be with us in achieving our goals of establishing world peace in the future."